This was a day trip for us, and even though it is only about 50 miles from the house it still bears mentioning in our travelogue for a couple of reasons - another pin for the collection, and another stadium for the list. Our day started out at the National Soccer Hall of Fame. This newer hall of fame has a lot of interactive areas for kids and adults alike to try out their soccer skills, as well as another area that has the usual artifacts and historical materials found in other halls. 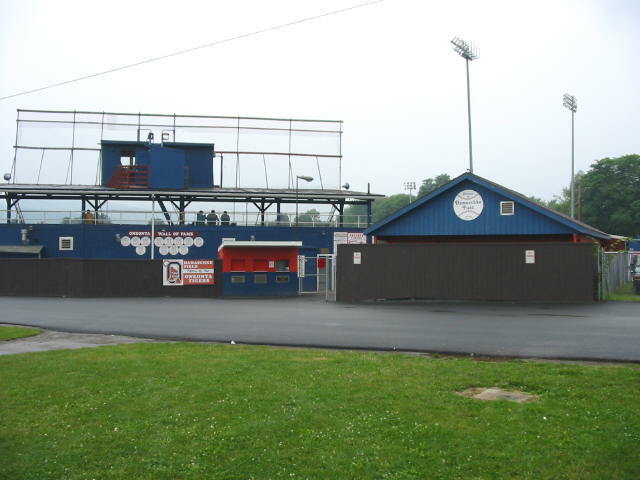 After doing some sightseeing along Route 28 (the road to Cooperstown), we headed back to Oneonta for the NY-Penn League game between the Oneonta Tigers and Vermont Expos at Damaschke Field. Depending on your reason for attending a baseball game, and your history with older versus newer stadiums, your view of this field will be greatly varied from others. In my opinion, this is baseball at its purest. It's an old, no frills stadium. There are no skyboxes, barely any box seats, mostly bleachers (wooden and metal, depending on which baseline you sit on), and, oh yeah, NO ALCOHOL! (which is good in my book!). For the players to get to the locker rooms, they have to actually walk through the crowd and under the seating areas. There are no in game promotions that benefit the fans, but there are multiple 'perks' for the players, including food prizes for doubles and triples, and silk boxer shorts (yep, you heard it right) for any player that hits a homerun! Final score of the game - Oneonta 8, Vermont 3. With no game going on in Binghamton because of the All-Star Break, we headed up to Oneonta for another Tigers game. Had dinner at Brooks' and then headed to the ballgame. It was a free ticket night, so the place was pretty packed. While looking for seats, we saw Vince and Brendan McInerney in the stands and ended up sitting with them for the game. In the fifth inning, the game was stopped for about 20 minutes because only half of the lights came on. Final score of the game - Oneonta 2, Batavia 1 (10).